We efficiently carry out systematic process at every stage, to make certain that the product basket is developed as per the specified requirements. Our fast transit facilities make us able to easily meet the expected delivery deadlines of the clients. Details : Aloe Vera is a medicinal plant with grows 2ft high on yearly basis. Aloe vera is stem less or very short stemmed plant, which grows 24-40inches high and the leaves are about 4inches wide. The leaves are thick and fleshy and green to grey in colour. The leaves are peeled and there’s a viscous liquid is found. The Aloe vera leaves are also used in making of pickles, vegetables, chyawanprash etc. The margin of the leaf is serrated and has small white teeth/ thorns. It is Medicinal Plant. In ayurveda, Aloe vera is a natural coolant herb. Bitter-sweet in taste, produces purgative effect. It is used in the treatment of bloating, constipation, gastritis, fever with Kapha dominance and respiratory problems. It is extensively used in liver and spleen disorders. Aloe vera is also used in the treatment of burns, boils. It calms pitta, detoxifies blood and is very useful in many skin diseases. It is good for eye power, it is natural detoxifier. Aloe vera is a good anti aging herb. It is good for hair, when used in the form of Aloe vera hair gel. Aloe vera flowers balance Vata and Pitta. They are also useful in intestinal worms. The Aloe Vera gel is used to make creams, soaps, shampoo, gel, Chywanprash, Herbal Powder etc. Aloe Vera’s demand as a Herbal Product is extremely high in India and world over. Aloe vera is a very low maintenance plant, it doesn’t evening require pesticides or manure. Aloe is grown in warm tropical areas and cannot survive freezing temperature. Once it is planted then you get yield for next 5yrs. 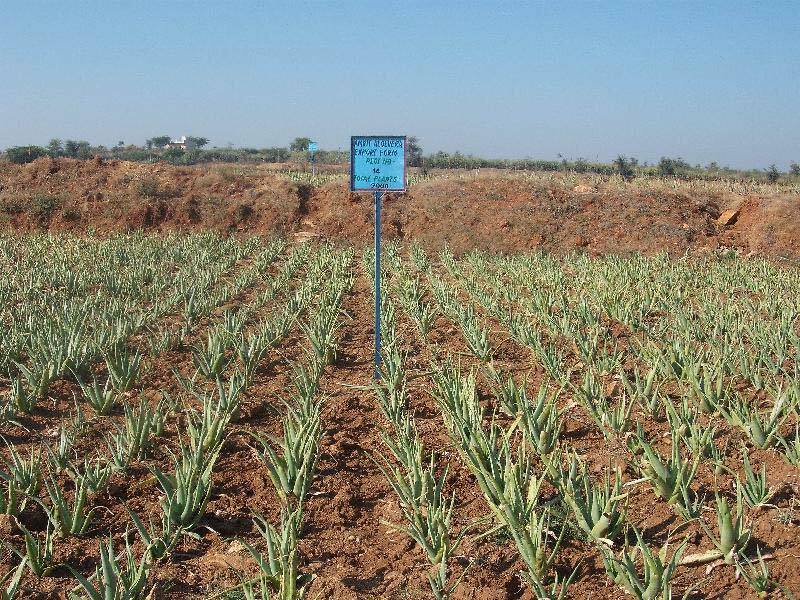 Aloe Vera can be cultivated on any soil for ‘dry land management’, sandy loamy soil is the best suited for it. It is grown almost all parts of India, even under constant drought conditions. However, the crop grows well in entire tropical and sub-tropical regions. Since its water requirement is very low, it is best suited for cultivation in Arid and semiarid region specially in Rajasthan, Gujarat, M.P and Maharashtra. It is grown successfully in marginal to sub marginal soils having low fertility. However, it is observed that its growth was faster under medium fertile heavier soils. Though, well drained loam to coarse sandy loam soils with moderate fertility and pH up to 8.5 are preferred for its commercial cultivation. Aloe babatiensis is the most common specie of aloe vera and grown in Rajasthan, M.P, U.P and Gujarat. Aloe Vera demand is immense therefore marketing it is not difficult. Wet aloe vera leaves are brought by many Ayurvedic Pharmaceuticals companies. Our company also provides the facility of Buy Back agreement. Within first year of cultivation, aloe vera leaves can be harvested. Leaving aside 3leaves rest other leaves can be cut using sharp hears. Generally 3-4 pickings per year can be taken depending upon the growth of plants. Plantation cost is to be borne only once and then for next 5yrs yield can be extracted. From each plant you get 3kg leaves within the first year of plantation. In the second year, within every 6months harvesting is done. This income continues for next 4years of cultivation. The planting material will be well packed and delivered to your location. and full consultancy aloevera cultivation and under buy back agreement.